I attended Desert Sands Junior High School with a daughter of Officer Polmanteer. I can't say I actually knew him and I would find it hard to believe his daughter would remember me (a random younger classmate). But I do remember him serving as a uniformed officer present at the Friday night school dances. These events were very well attended with the crowds of 7th and 8th graders. At a glance he was a huge imposing man in his uniform, by appearance alone he could certainly command respect. But in all the times I was in his presence he was actually quiet, deliberate and professional. There was never as much as even a minor scuffle at any of these dances with the throngs of kids around. I'm thankful we had officer Polmanteer to watch over us. Your sacrifice and that of your family is not forgotten. Rest in Peace. This was my grandfather I never got the chance to meet him. Thank you for your service we will take it from here. I know that you are watching over us. I never meet you but I love you and miss you. There is not a day that goes by that I don't think about you,and wish I would've made different choices.i have changed time to start my life and make better choices ..Julia my wife and ,I love you and wish you were here.see you in heaven dad!!!! I was Bob's Field Training Officer upon his graduation from the academy. Of course his size was striking but so was his kindness and desire to learn the job. I remember one night, I was driving, and we stopped a car of three or four gang members near Tower Plaza station. As I got out of the marked unit I could tell this stop was going to be a problem. The occupants were fidgeting and making motions of hiding or retrieving something under the seats. Bob started getting out on the passenger side of our marked unit. He got out and got out and got out. And as the gang members saw Bob unwind from the car they became very still and quiet, to the point of being submissive. The occupants quietly confessed to having stolen the car and were sent off to jail. Bob was a great cop and soon was out on his own. I think of you often Bob. God took an Angel home when he took you back. To fully appreciate the heroes of the present, we must recognize our heroes of the past. Your heroism and service is honored today, the 9th anniversary year of your death. I am priviliged to leave a tribute to you. Your memory lives and you continue to inspire. Thank you for your service. My cherished son Larry Lasater was a fellow police officer who was murdered in the line of duty on April 24, 2005 while serving as a Pittsburg, CA police officer. On May 5th, 2010 our squad stood near 37th Street & Thomas and honored your memory. It has been just over twenty six years since you answered the call and made the ultimate sacrifice. While none of us had the privilege to know you, we will never forget and you will live on in our hearts. Bob and I worked at Squaw Peak (700) in the early 1980's. He was such a big man, imposing in appearence. But his smile and his laugh were even bigger than his stature. What befell him was a terrible tragedy. I pray his family found a way to cope with his loss. I pray that the Heavenly Father may assuage the anguish of your bereavement, and leave you only the cherished memory of the loved and lost, and the solemn pride that must be yours to have laid so costly a sacrifice upon the altar of freedom. On today, the 24th anniversary of your death, I would just like to say thank you for your service and sacrifice for the citizens of Phoenix. And to your your family and loved ones, I wish to extend my deepest sympathy. Bob was a gentle giant. We were on the same squad in the early 80's out of Squaw Peak. We connected because we both were on departments in Michigan before we moved here. When I drew him as a partner in a racquetball league I thought his size would slow him down, MAN was I wrong, he controlled the court. And it was great to know he was on the way when things turned to ( ) on the street. I would like to let Bob's family know that he had a huge impact on my life. Before I became a Phoenix Police Officer I was a waitress at a Denny's Restaurant where Bob worked off-duty. Bob convinced me to go test for the Phoenix Police Dept.. I started the testing/hiring process but very sadly Bob was killed before I started into the Academy in July 1984. I went to Bob's services and was still determined to become a Police Officer. I have Bob to Thank for steering me in the direction of what was a very full-filling career,and where I also met my husband of 23 years, Wesley (#2613-ret). I retired from the department and stayed on as a Reserve Officer. Bob was always so proud of his family and his job. Bob's favorite meal was a fish dinner, with a salad with lots of Blue cheese dressing and 2 Large glasses of milk. My co-workers and I always felt safe and secure when Bob worked, because customers used to always say they didn't want to tackle with "that officer" refering to his size. I just wanted his family to know I have had a blessed life from his great direction. 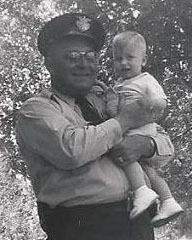 My dad had terminal cancer at that time and it made him so proud of me becoming a Police Officer,(which he was able to see happen before he passed away). Bob you are sadly missed by family and friends,rest in peace my brother. It's hard to believe that Bob (The Gentle Giant)has been gone for 24 years. We worked at Squaw Peak Precinct in the day. He was a kind hearted sole who always treated the community he served with a smile. He was almost too nice to be in this line of work. But he loved riding his police motor. He left us way too early but I am sure he is in GOD's Kingdom looking down on us and smiling. Waiting for the day we will all meet again. I was a rookie at the time and had just made a backup for Bob on a stop. It was a tremendous shock to get the accident call just a few minutes later and discover it was Bob. That first hand experience of how fragile life is and how quickly things can change was a lesson I carried with me throughout my career. He was a great guy, and I think of him often. Bob - the gentle giant. Quick to smile - quick to learn - always quick to help - Miss you friend! I remember having long talks with Robert about riding motors,he was a very nice young man anhd his accident stayed with me for a long time. I will remember that day forever. The Department and the citizens of Phoenix miss you. Your daughter has followed in your footsteps and is a very loved and respected sergeant. You will never be forgotten. Earl and Laura Fisher and your family at C.O.P.S. It's a great honor to have been acquainted with Officer Robert Polmanteer. I reflect back to Friday, May 4th, 1984 to the date of his tragic death: Officer Polmanteer's daughter, Charmane was a classmate and friend of mine and we were all celebrating at school with a Hawain themed school dance, when the news of her fathers accident came. It was extremely sad to see this happen to my friend and her family. At that time we did not know what we would all turn out to be, however, I am happy to say that Charmane has followed in her fathers footsteps, so to speak, and she is also a Phoenix Police Officer today. Our paths cross every now and then, but I want her to know that I am proud of her. After all she has been through in her life and to lose her father at such a young age, she has kept it together and succeeded. This site memorial dedication to Charmane's father is a great tribute to him and his family. Charmane, I am sorry that I won't be able to make the dedication, however, know that I am always thinking about you and that I pray for your safety often. They put Youre memorial marker up on Thomas Road brother, every time I drive by Ill ask you how its going up there. We have lost many great motor officers in our department and Robert you were among the top. Those of us who worked in the squad cars alwyas teased you guys but in our hearts we always had love and respect for the danger you always faced that was not from the evil agents we both faced but by the unaware drivers who put you in their cross hairs. Thank you for your devotion to protecting and serving Gods children in our community, for your presence among us and for your bravery in performing your duties. You will never be forgotten by your brothers and sisters in law enforcement. Rest in peace my brother. Give God a hug for those of us waiting our turn to go to His house with you.